Manage your recipe collection: Living Cookbook makes it easy to enter new recipes, copy them from the Internet, or even scan them from cookbooks and magazines. Want to share your recipes with others? You can export or e-mail your recipes in a variety of formats, including FDXZ, FDX, HTML, Meal-Master, MasterCook and more. Plan meals: Just drag and drop recipes, ingredients and menus onto your meal plan. Plan a single meal, a day, a week, a month or more. Ready to shop for your meals? Just add your meal plan (or any part of it) to a grocery list. Calculate nutrition for any recipe, menu or meal: Living Cookbook's nutrition display is completely customizable. Want to see nutrition facts just like you are used to seeing them on product packaging? We can do that. Want to see more than 150 different nutrients, including Weight Watchers Points, trans fat, net carbs, vitamins, minerals, lycopene, beta carotene, caffeine and more? We can do that, too. Create grocery lists: Living Cookbook makes it easy to create a shopping list from scratch or from recipes, ingredients, menus and meal plans. The software will combine like items, organize them by your store's grocery aisles, and calculate the cost of each item and the cost of the entire grocery list. Publish and print cookbooks: Want to create your own cookbook as a Christmas gift, for retail sale, or for a church or school fundraiser? Living Cookbook can help you do it. You can print a cookbook with a cover page, table of contents, recipes and index directly from the software with just three clicks. 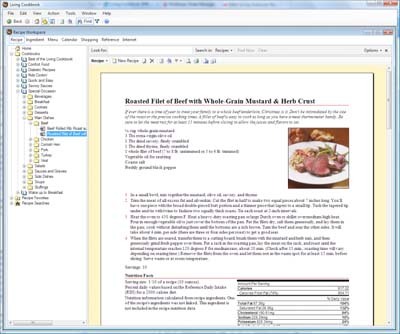 Or you can export your cookbook to Microsoft Word and customize it to your heart's content. Scan images directly from your flatbed scanner, digital camera or iPhone. Interative image, video and attachment views. User-defined recipe, ingredient and menu data. File attachments for recipes, ingredients, menus, glossary items and techniques. Support for multiple recipe, ingredient, menu and glossary item images. USDA SR-23 nutrition data. Import Cook'n DVO files. Compressed export file format (FDXZ) resulting in 50% smaller export files. Customizable recipe capture and import units. Scale menus to any number of servings. New image preview window. Automated support system (in addition to e-mail, support ticket system and user forum). 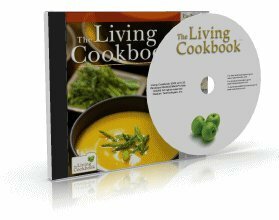 Use Living Cookbook to organize recipes, plan meals, create menus, calculate nutrition information, create shopping lists, publish cookbooks, export, e-mail and much more. The software is extraordinarily flexible and easy-to-use and Living Cookbook's comprehensive help file, tutorials, demo videos and customer support will ensure that you can find and learn to use the features you need. The software comes with more than 1,000 recipes, and thousands more are available online. Find out why Smart Computing Magazine, Choice Magazine and Which? Magazine all chose Living Cookbook as the best cooking and recipe management software. Living Cookbook makes it easy to enter your recipes. You can type them in, scan them (using the OCR software that came with your scanner) or copy them from the Internet. The software also makes it easy to transfer your recipe collection from other recipe management programs such as MasterCook, Cook'n, Meal-Master and BigOven. 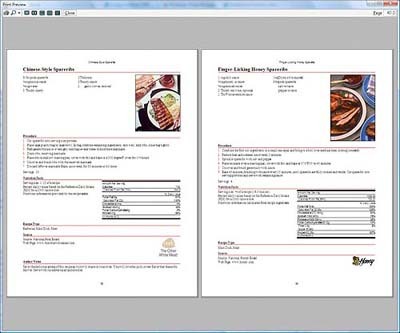 You can publish your own cookbook complete with table of contents, pagination and index. 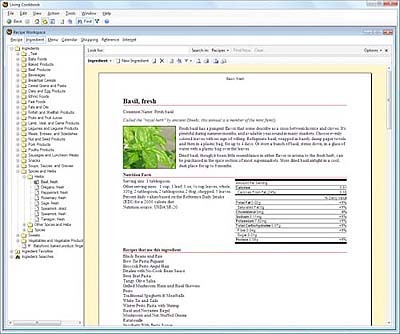 You can preview and print your cookbook directly from Living Cookbook or export it as a Microsoft Word (DOCX) document for additional editing. 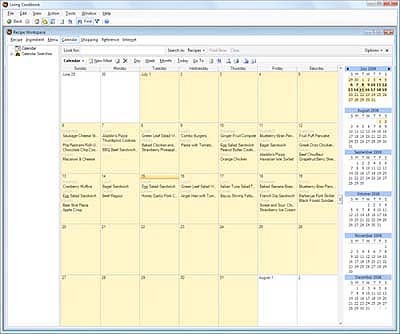 The meal planning calendar lets you drag and drop your recipes onto the calendar. You can view your meal plans by day, week or month. Creating a shopping list for a meal plan is as simple as clicking on the appropriate days and selecting "Add to Grocery List" from the Action menu. Living Cookbook lets you calculate nutrition for any recipe, ingredient, menu or meal plan. You can customize your display to show over 150 different nutrients including calories, fat, carbohydrates, vitamins, minerals and more. You can even calculate Weight Watchers Points. Working with recipes Enter recipes with as much or as little detail as you like. Add images to recipes. In fact you can add multiple recipe images, a source image and an image for every recipe procedure step, if you want to. Copy recipes from the Internet. Calculate recipe nutrition from the recipe ingredients or enter the nutrition data manually. Calculate recipe costs. Anda baru saja membaca artikel yang berkategori Cookbook / Living Cookbook dengan judul Living Cookbook 2011. Anda bisa bookmark halaman ini dengan URL http://newhardwaresoftware.blogspot.com/2012/10/living-cookbook-2011.html. Terima kasih!